Katrina-Ann R. Kapāʻanaokalāokeola Nākoa Oliveira (Native Hawaiian) serves as the Graduate Chair & Professor of Kawaihuelani Center for Hawaiian Language at Mānoa within Hawaiʻinuiākea School of Hawaiian Knowledge. Hawaiian geographies, epistemologies and language acquisition methodologies. Current community engagement efforts primarily target the Maui community. 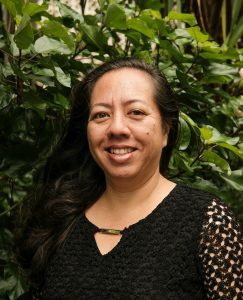 I am working in partnership with Maui Nui Botanical Gardens and the University of Hawaiʻi at Maui College to develop place-based curricula for use by the Maui community, particularly the ʻōlelo Hawaiʻi speaking community. HAW 301 Third-level Hawaiian (3) Continuation of 202. Conducted in Hawaiian. Advanced conversation and reading. Pre: 202 or exam, or consent. HAW 302 Third-level Hawaiian (3) Continuation of 301. Pre: 301 or exam, or consent. HAW 321 Hawaiian Conversation (3) Systematic practice on various topics for control of spoken Hawaiian. Repeatable up to six credit hours. Pre: 202 or consent. HAW 401 Fourth-level Hawaiian (3) Advanced reading, writing, and discussion in Hawaiian. Transcribing and translating Hawaiian language tapes. Translating English into Hawaiian, and Hawaiian into English. Pre: 302 or exam, and consent. HAW 402 Fourth-level Hawaiian (3) Continuation of 401. Pre: 401 or exam, or consent. HAW 429 Ka Hōʻike Honua (3) Study of Hawaiian land tenure practices through readings and discussions of audiotapes, written primary sources, maps, wind names, rain names, ʻōlelo noʻeau (wise sayings), and mele (poetry). Readings are drawn from 19th and 20th-century Hawaiian newspapers and other primary sources. Pre: 302 (or concurrent) or consent. HAW 430 Ma Ka Hana Ka ʻIke (3) Study of traditional Hawaiian language and cultural practices through hands-on applications and lectures. Pre: 302 (or concurrent) or consent. HAW 625 Moʻolelo Hawaiʻi (3) Intensive study, research, and analysis of Hawaiian history. Repeatable two times with consent of advisor. Pre: 402 or consent.